I didn’t come to yoga; rather, yoga came to me. In 2008, I had just graduated college (or as my friends here in the UK say, Uni), and was not in a happy place. To say I was lost in a grey cloud of despair would be the understatement of the century. I was still living in NYC at the time and was an extremely non-active member of a local gym. As down as I’d ever been, I got to the point where I was desperate for some sort of relief, and on a whim, walked into the gym one day and saw there was a yoga class on that evening. I had done it once before, but it didn’t click at the time, so back of the mind it went. This time, however, was very different. I walked into the class, no idea what to expect, and got on one of the blue mats offered to students. We began to flow, and that night I felt alive for the first time in months. The energy surged through my body and mind, and as I lay in Shavasana at the end of the practice, tears streamed through my closed eyes, so happy to be feeling something, anything, again. In my life, I will never forget that class or the man who taught it, as I looked at it as the class that saved my life. Yoga wasn’t always a regular thing for me over the years, the consistency of my practice coming in waves, but each and every time I got on the mat, an inner peace would take over and provide exactly what was needed in that moment. 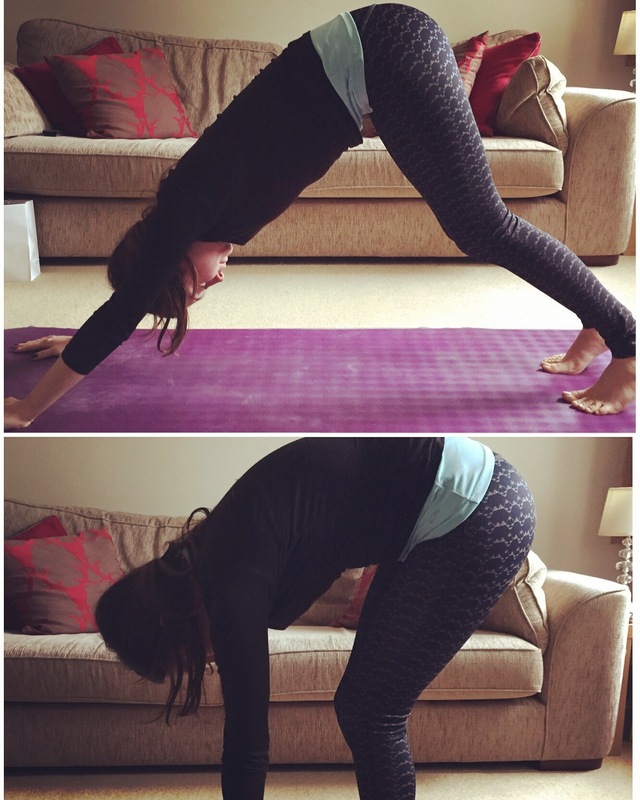 When I moved to the UK nearly two and a half years ago, I really struggled to find a studio that felt right (if anyone knows of a great studio in SW London that isn’t hot yoga, please let a sister know!). After a series of online video attempts that never captivated my attention long enough, and a work/commuting schedule that left me little to no energy, my practice suffered and with it so did my head-space. I did my best to keep practicing despite these frustrations, but it wasn’t until I happened upon Yoga With Adriene on YouTube earlier this year, that I found what feels good, to paraphrase her brilliant mantra. You may or may not have heard of her, but if you are searching for an unpretentious approach to yoga in the form of someone who just gets it (and could also easily be your taco loving best friend), then she is your girl. Due to a couple of injuries, I was off the mat again for a bit, and then back on, and then predominantly back off the past month while being snowed under at work preparing for my departure (which finally happened last Friday!). So why am I sharing this with you? Well, my hamstrings are perpetually angry, and any time I miss more than 5 days of practice, they reset themselves and I have to start at square one to loosen them up again. I have had countless problems with my back and neck, easily injuring myself from the slightest of twists and bends, and have the creeky and painful knees of a tin-man. I am convinced my feet will never touch the ground in Downward Dog, and my head will never make it to headstand from Extended Forward Fold, although I know with time and patience anything is achievable. It would be so easy to sulk and compare myself to all the beautiful yogis on social media, or even just the person next to me in class who looks waaay more advanced than I am, even though there’s a good chance I’ve actually been practicing for more years. Sometimes I do indulge in this envious state, even though I know how self-destructive it can be. But one of my favorite teachers back in NY always told the class, “Don’t compare your yoga journey to anyone else’s yoga journey,” and that is something I try to remember every time I come back to the mat. In fact, you could apply this saying to any area of life, just replace the word ‘yoga’ with whatever fits in that moment. Setbacks are going to happen in life, and you can just give up entirely (because we all know it’s very hard to get started on something just once, let alone multiple times), or you can keep going for it till you can find a way to make it work for you. To look at me now, you’d think I’ve only just begun, and in some ways that is true. But the asanas are only part of the yoga journey, and where I lack at times in physical flexibility, I like to think my yogic-mind makes up for in spades (and don’t be fooled; this takes mounds of practice and resilience, too!). I’m hoping with this new chapter in my life, I’ll finally find a routine that sticks so I never have to go back to tight legs again. I hope that whatever it is you’re working on finally sticks, too. The whole point of this, though, is to say we all have our own journey to follow, and it is so important to never judge a book by it’s cover (or compare your cover to another). Don’t ever give up on the things that make you feel alive, and never let a setback stop you from getting to where you want to be. I may never be able to touch my face to my knees, but that doesn’t make me any less of a yogi than the next person. The beauty of the time we’re living in, is it’s now so easy to track your progress and that is exactly what I plan to do here. Taken three days ago. Perfectly imperfect. This is what a yogi looks like. Progression photos to follow in time! If this inspires you to stay the course, or if you have a journey of your own (yoga or otherwise), I’d love to hear about it in the comments below!